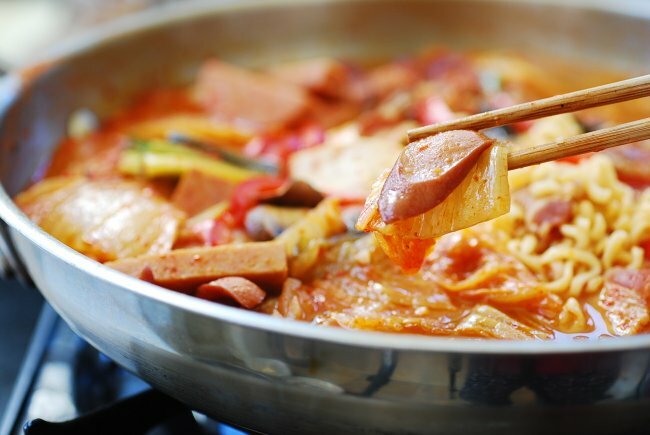 Budae jjigae (부대찌개) is a fusion dish that incorporates American processed meats such as Spam, bacon, and hot dogs into a Korean stew. 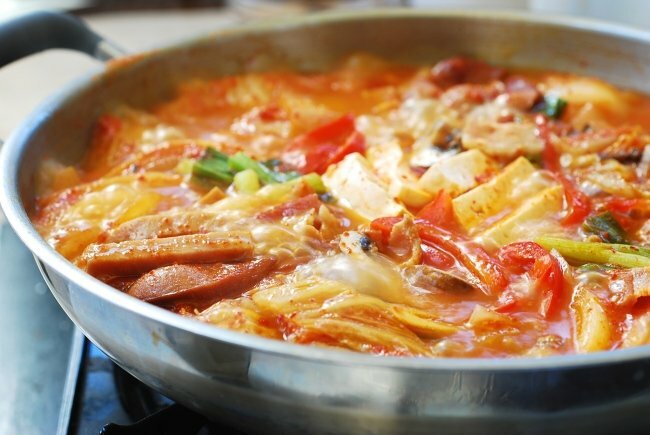 Budae is a general term for a military base in Korean, but budae jjigae is translated into “Army stew” or “Army base stew” because of its origin. In the 1950’s, food was extremely scarce after the three-year long Korean war which ended in 1953. So, those surplus processed meats from the U.S. military bases were great sources for Koreans to supplement their food shortage. 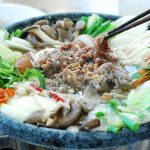 In the city of Uijeongbu (의정부), about 12 miles northeast of Seoul, where U.S. Army bases are stationed, a restaurant owner started to make a stew with those meats from the Army bases. 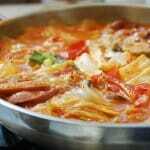 Since then, budae jjigae has become immensely popular all over the Korea. 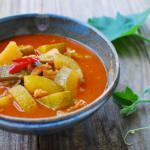 Growing up as a child in 1960’s, I remember occasionally having things like Spam, hot dogs, or bacon in our kimchi stew. Those American products were not legally available to Koreans at the time, but somehow they found their way to Korean homes through a black market. That was a time when the best treat a little child could wish for was a Hershey chocolate bar. 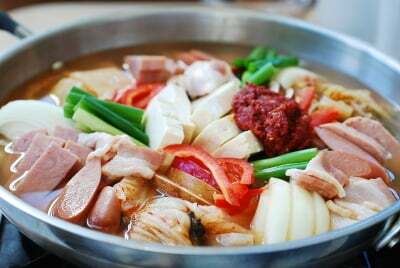 Budae jjigae is relatively easy to make. 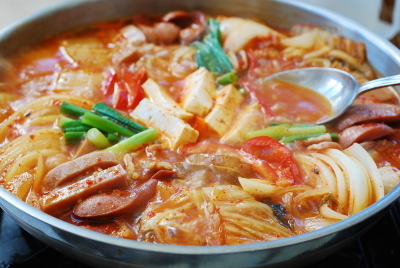 As long as it has kimchi and some American processed meats, it’s a budae jjigae. 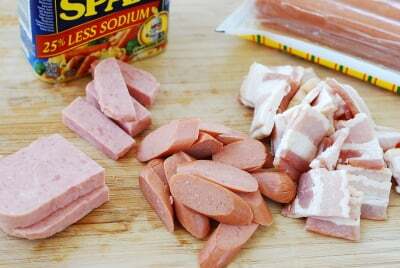 You can’t go wrong with the combination of sour kimchi and fatty bacon, spam and hot dogs. 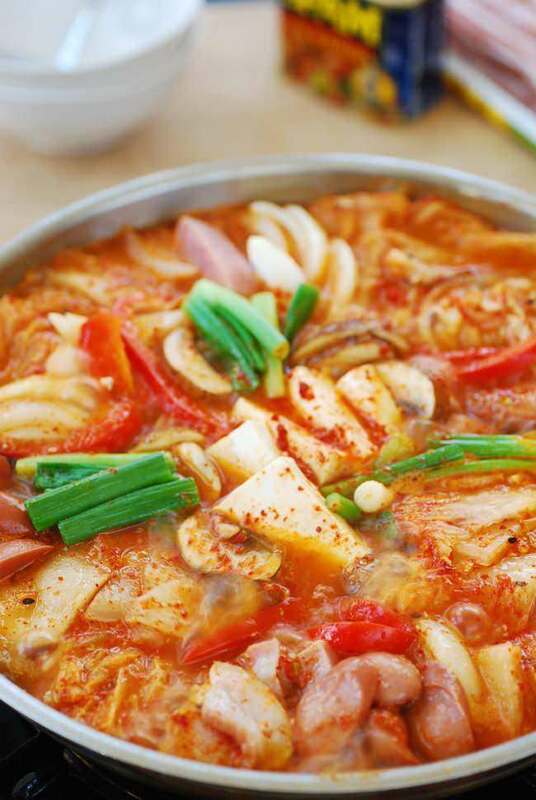 The older the kimchi is, the better your stew will taste. 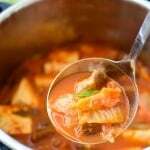 I had saved the last batch of the kimchi I made last fall for this budae jjigae recipe post. Slices of American yellow cheese and canned baked beans are also commonly added. 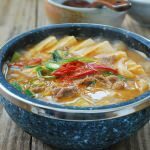 Some other popular additions are instant ramyeon noodles, rice cake slices, and/or starch noodles. Be careful though. Too many starches will make the stew very thick. I like to keep it simple, and here’s how I make it at home. Cut the ingredients into bite size pieces, and arrange them in a medium size shallow pot. Mix all the seasoning ingredients in a small bowl. Add the broth, and stir in the seasoning. 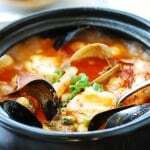 Find how to make anchovy broth here - http://www.koreanbapsang.com/2011/06/how-to-make-anchovy-broth-for-korean.html. Btw, I think you have your advertising settings wrong because I’m getting adult ads on top of the page (very graphic). You’re welcome! I am happy to help you recreate your mom’s food. Oh goodness – thanks for letting me know. I will take care of it right away. Hi Yongmin – It’s not really about brands. It’s the type of gochugaru. 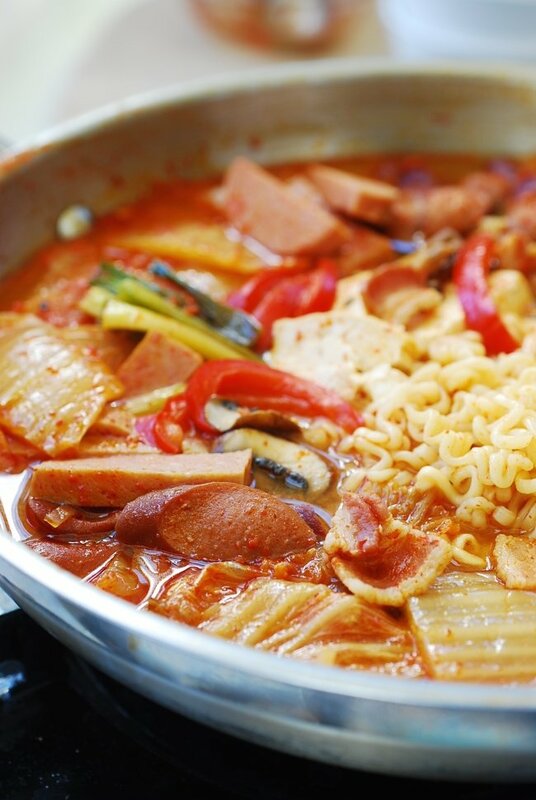 Some are labeled as “hot” 매운 고추가루. The ones made with cheongyang gochu 청양고추 are very hot. Hope this helps. Hi Susanne – Koreans usually dry/dehydrate zucchinis to preserve and then rehydrate them when ready to use. We stir fry them to make side dishes or add to stews and soups. 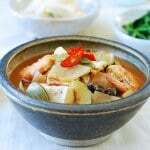 You can make kimchi with zucchini, although not common, but it will not keep long. Hope this helps. Just wanted to let you know that I loved the little history lesson on the recipe – its always interesting to learn and a great talking point when serving to guests! Very well written & I will definitely continue to check back for more interesting recipes. I love your website! I find your recipes approachable yet elegant. I love your website! My mother is Korean and she cooked Korean food for me everyday when I came home from school. I am now 26 and cannot depend on her anymore 🙁 even though I want to haha! Rather than calling her every two minutes I can look my recipes up on your site. 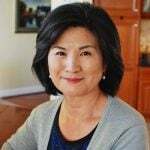 Thank you for putting your receipes online for us to keep Korean culture going in our future generations as well!! 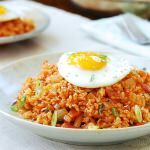 My kids love Korean food! This was simply amazing and so simple to make. It was a beautiful dish for company and I loved that I could talk about the history behind the dish. Thank you for sharing this! That’s very interesting. I had to google coucroute and found a recipe by Jacques Pépin on the Food & Wine website. Will try to make it! Thanks for the tip! Ha that’s interesting! Hope you enjoy it.